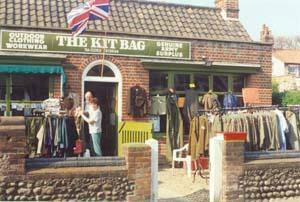 The Kit Bag at East Runton is North Norfolk's outdoor and military store. Regatta clothing stocked. Many items at clearance prices. Kid's gear, workwear and much more. 1 mile west of Cromer on the A149 Coast Road. Closed Christmas and Boxing Day. On A149 coast road 1 mile west of Cromer.